People with cerebral palsy often have problems with putting on clothing. We aim to make it easy and inexpensive for them to modify clothing for their needs. Our plan is to make a kit that can be distributed to families in need, who have children with CP, so they can easily get the adaptive clothes they need. This is a problem that affect millions of people. Because cerebral palsy most often happens when people don't have a lot of money, and therefore good healthcare, we need to gear these products towards cheapness. - You need to show the final products here, show 3D prints of the snap and button in action! - You should have a diagram for each of the devices you made, can you do this? - Let's talk about this tomorrow. 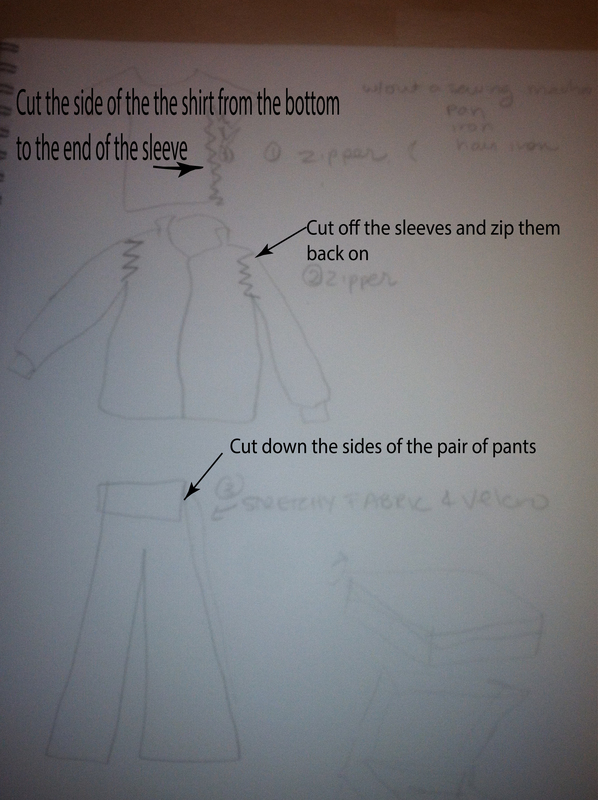 The process began with a brainstorm on how we would make clothing more adaptive for individuals with cerebral palsy. Initially, we considered major modifications: We thought about cutting out the back of jackets to allow the clothing to fit on the kid more easily. We also had the idea of detachable sleeves, because sleeves are often the hardest parts to put on for adaptive clothing. However these modifications would require significant work and potentially be very expensive. Ultimately, we decided to replace three things: buttons, zippers, and snaps. These things were chosen because they would be the easiest to change, which is important when you don't have a lot of tools. They're all attachment points as well, and people with CP have trouble bringing two things together with any dexterity. Most importantly, these are affordable minor modifications. The button was a pretty hard challenge. How do you print something rigid that will universally fit over any button? We decided to use a slot with divots, so you could easily pull the button through. The divot originally was much larger than it needed to be, so we reduced the size, while making sure to have enough material that the button could hang on. 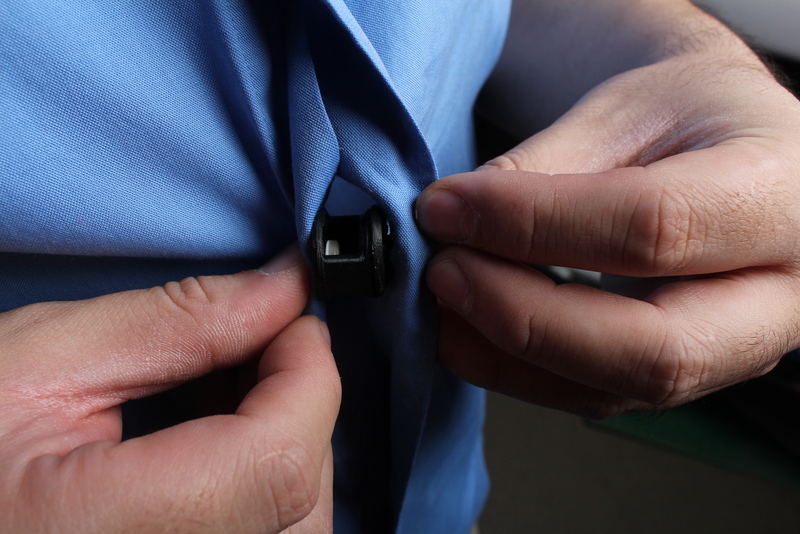 The other side of the button replacer is simply a button with a flat side; Velcro is put on both sides so they attach. Our goal with zippers was to make them easier to grip. The plan was to create an attachment for the head of the zipper that is easier to move when you lack dexterity. You can use a little piece of string or cloth to connect the zipper to our attachment. It's easy to move it with one hand, and easy to grip even when you're shaking. Those are both problems that people with CP have with moving zippers. One major difficulty with designing the zipper was finding the right shape. We started out with a star, which we thought would be fun for kids to play with and zip. The problem with that was that it could poke someone in the eyes. Even if you flipped the star, so the points faced downwards, it would also be painful to pull, because your fingers would get caught in the bottom points. So, we decided to use a nice, simple, easy to grip shape: the square. The snaps were relatively easy. We modeled snaps in Fusion by creating a 2d cutaway and revolving it to get the shape we wanted. The only challenge was getting the snaps to fit together. We made the snap parts bigger and smaller until real snaps fit with the ones we made. We modeled them off real snaps, and tested them by fitting them to real snaps. They are connected by Velcro, like the button replacers. The most major modification we made was for tight clothing. To make tight clothing easier to put on, we essentially designed a Velcro 'fly', except it would be installed on both sides of the clothing. We used Velcro with a sticky back, so it could be attached more easily. 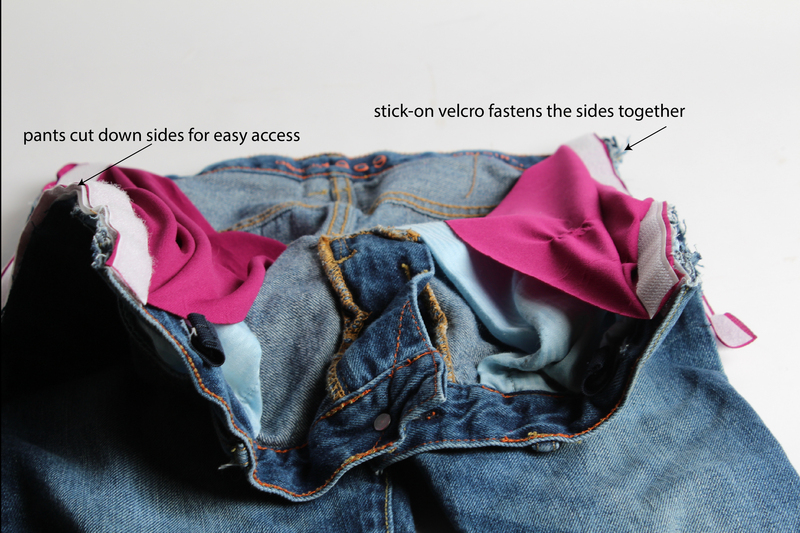 We decided to show the replacement on the sides of jeans. There, we added an elastic connection, to make the pants hold together, and put the Velcro over the zippers. - The text is terrific, but this text should be moved to "Final". Your text for "Process" should discuss the iterations.